300 watt heat shrink gun, mini size easy to use for multi-function DIY works. Comfortable and lightweight paint heat gun, ideal for heat shrink tubing, embossing and drying a variety of paints, glues and removing adhesive labels. Built-in stand for self-support and table top use. Power on the heat air tool. Hold the heat gun as shown on the picture.do not touch the hot nozzle. Keep 5-6cm distance between the heat tool and item. Do not continuously use more than 10 mins to prevent overheated. Your Satisfactions are very important to us, Please don't hesitate to contact us if you have any questions. We'll try our best to assist you within 24 hours. Thanks! 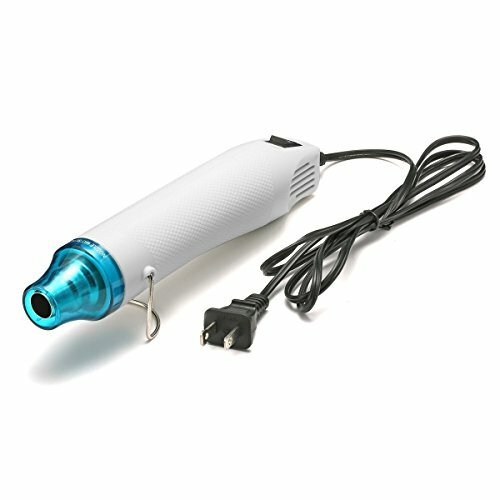 ★ Mini Heat Gun for crafting, embossing heat tool. Useful DIY equipment for heating shrinking film, removing adhesive labels and others purpose. ★ Built-in stand for self-support and table top use, good tool for ceramic creations. ★ The heat vents designed in both tail sides to reduce the internal temperature and extend the product duration. ★ Heats up in a few seconds and quickly gets hot temperature, but doesn't heating the handle or wires. ★The heat shrink gun is only focused directly in front of the head and don't worry about burning you fingers while holding the heat gun.